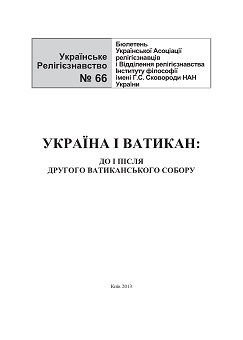 No 66 (2013): Ukraine and the Vatican: before and after the Second Vatican Council. Institutionalizing transformations of the Greco-Uniate Church in the context of the ethnoconfessional policy of Russian autocracy (1772-1795). Roman Catholic Church in interconfessional relations in the Right-Bank Ukraine: history and modern state. Roman Catholic Church in the System of State-Confessional Relations in Volhynia (1944-1945). The state of the Roman Catholic communities in the period of a forced anti-religious offensive of the Soviet state (1950s - the first half of the 1960's). Unitarian activity of Metropolitan Andrey Sheptytsky in the context of the Vatican's Eastern policy (1901-1917). Joseph Slipy as a builder of the Ukrainian Greek Catholic Church in the diaspora. Abstract of Collective Work "Ukraine and the Vatican: before and after the Second Vatican Council"